How to eat your way to a clear complexion. Great nutrition is reflected in a glowing complexion. By incorporating the right ‘skin’ vitamins, you can eat your way to a clear skin. Feeding your skin boosts radiance, improves elasticity and helps to prevent and combat blemishes. Ideally aim to incorporate these vitamins into your daily diet and, if that’s tricky, by all means opt for supplements. Vitamin A can be found in the following foods; eggs, whole milk, liver, carrots, mango, spinach and fortified cereals. Vitamin B can be found in the following foods; wheat germ, oatmeal, whole wheat, bran, whole brown rice, dairy products, milk, liver, kidney, fish and eggs. Vitamin E can be found in the following foods; almonds, Sunflower seeds, peanut butter, hazel nuts, sunflower oil, spinach, broccoli and mango. Vitamin C can be found in the following foods; orange, grapefruit, mandarin, lettuce, spinach, green pepper, strawberry, tomato and cabbage. Vitamin D can be found in the following foods; milk, brown rice, fortified margarine, salmon tuna, liver, cheese and natural sunlight. Zinc can be found in the following foods; dairy products, beans and lentils, yeast, nuts, seeds, cereals and pumpkin seeds. Sometimes our diet does not contain all the vitamins and nutrients we need to keep our skin looking healthy. Radical Image by Aloe Ferox provides a natural solution to clearer skin. Vitamin C is a powerful anti-oxidant that neutralises harmful free radicals. Omega 3 although a fatty acid and not a vitamin, is worth mentioning here as it is excellent not only for your complexion but for overall health. There are several foods rich in Omega-3, however flax seeds and walnuts are top of the list due to the concentration of Omega-3 fatty acids. Also easily accessible and versatile sources are fish (salmon, cod, mackerel), beans (soy, kidney) and olive oil are excellent food sources of omega-3 fatty acids. A short-cut perhaps to supplementing your nutrition. 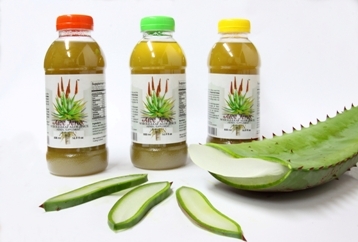 With over 130 naturally occurring medicinal properties Aloe Ferox Whole-Leaf Juice has numerous wellbeing properties. How do you find the best skincare products? 4-step skin care routine for a fresher complexion and softer skin at any age. Look in the mirror, your skin reflects your wellbeing. If you live in the city, take a walk in the park to be well and stay well.